If you're an enterprising young chef, it must be tough running only one kitchen these days -- friends and colleagues might think you're a slacker. With the February 1 opening of his Alias Restaurant, a more ambitious sibling to the terrific AKA Cafe (both offshoots of 71 Clinton Fresh Food), Scott Ehrlich (pictured) joins the ranks of chef-nomads like Mario Batali and Tom Colicchio, wandering tocques who hustle from one hot spot to another on a nightly basis. Since Alias (formerly a Latino rice and beanery also called Alias) is only half a block south of AKA, Ehrlich doesn't have far to go -- a good thing if you wear clogs to the office. There, in a dining room designed by Takehiro Murao, the architect responsible for Jewel Bako, and a kitchen twice the size of AKA's, he'll have more room to experiment with clever pan-American bistro dishes like fried rabbit and waffles, skate fish cakes, and, in tribute to a fading Lower East Side industry, a pickle-plate appetizer. 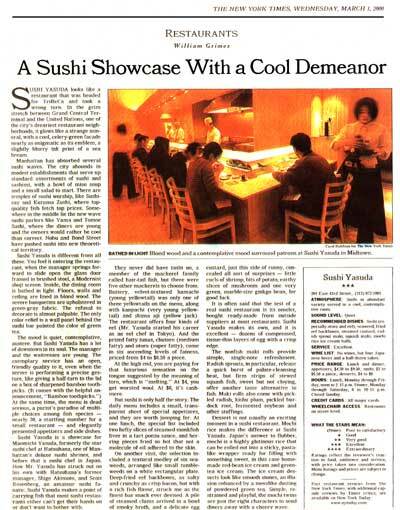 one of Manhattan's deluxe sushi shrine s, and before that a sushi chef in Japan. Now Mr. Yasuda has struck out on his own with Hatsuhana's former manager, Shige Akimoto, and Scott Rosenberg, an amateur sushi fanatic Sushi Yasuda makes a point of carrying fish that most sushi restaurants either can't get their hands on or don't want to bother with. They never did have tasht uo, a member of the mackerel family called hair-tail fish, but there were five other mackerels to choose from, Buttery, velvet-textured hainachi (young yellowlai!) was only one of three yellowtaits on the menu, along with kanpachi (very young yetlow-tai!) and shima aji (yellow jack). 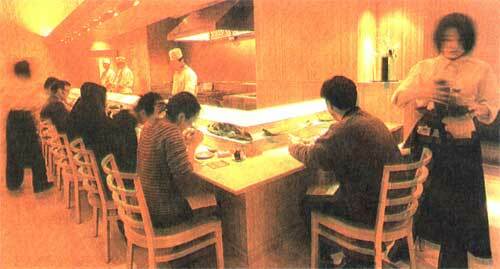 The restaurant offers four kinds of eel (Mr. Yasuda started his career as an eel chef in Tokyo). And the prized fatty tunas, chiitoro (medium fatty) and otoro (super fatty), come In six ascending levels of fatness, priced from $4 to $6.50 a piece. At the high end, you are paying for that luxurious sensation on the tongue suggested by the meaning of toro, which is "melting." At $4, you get worsted wool. At $6, it's cashmere.But sushi is only half the story. The daily menu includes a small,, transparent sheet of special appetizers, and they are worth jumping for- At one lunch, the special list included two hefty slices of steamed monkfish liver in a (art ponzu sauce, and herring pieces fried so hot that not a molecule of oil adhered to the skin. Yasuda. Japan's answer to flubber, mochi is a highly glutinous rice that can be boiled out into a sticky, pasta-like wrapper ready for filling with something sweet, in (his ca,se homemade red-bean ice cream and green-tea ice cream. The ice crparn desserts look like smooth stones, an illusion enhanced by a mosslike dustingof powdered green tea. Simple, restrained and playful, tlie mochi twins are just the right characters to send diners away with a cheery wave. Scientists claim that winter makes people depressed. Less light = sad days. only in wintertime? No -- anytime at Alias Restaurant, which opens today on the Lower East Side. Pedigreed chef Scott Ehrlich (71 Clinton Fresh Food, Lupa, Veritas) has created an Americana menu of what he calls upscale contemporary comfort food: duck confit, black-eyed peas, fried rabbit. Best-sounding dessert? Three mini-doughnuts filled with dulce de leche, orange cream, and chocolate. If the food's not enough to lift your mood, the cheery interior should do the trick. Designed by Takehiro Murao of Jewel Bako, the small restaurant is draped in warm oranges and reds. Cutest feature? The old-school bodega-style sign on the storefront. If all else fails (you've got it bad! ), hit one of the new bars in the 'hood on the way home. But remember, sunshine, spring is just a few weeks away. 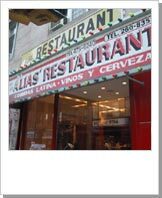 Alias Restaurant, 76 Clinton Street, at Rivington Street (212-505-5011).